Applications This course relates to a broad range of fiber optic applications such as telecommunications, automotive, space and military telecommunication systems. For Whom Intended This course provides an excellent foundation in optics and the use of fiber optic cabling for division chiefs and QA/QC personnel as well as technical personnel involved in design, manufacturing and testing and calibration of fiber optic cables and laser applications. It is especially useful for engineers involved in telecommunications design as well as those designing and testing fiber optics replacement systems for traditional wiring, especially on-board systems such as aircraft, military vehicles, space and naval vessels and automotive platforms. Brief Course Description This course provides an understanding of the theory of optics and its application in the transmission of data along fiber optic cables. 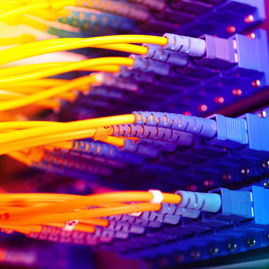 Advantages of using fiber optics are discussed such as: a large amount of data (wide bandwidth) can be transmitted over a single piece of fiber at high speeds; optical transmission is less susceptible to electromagnetic interference (EMI), thus reducing problems due to noise and increasing the security of data transmission. Disadvantages of fiber optics are discussed along with measures needed to overcome them, such as selecting good quality connectors and preparing procedures and training for fiber optic system assemblers. The course covers each item in the fiber optic system, such as types of fiber, light source, transmitters, receivers, repeaters, amplifiers, together with test and measurement techniques. Special emphasis is placed on Dense Wavelength-Division Multiplexing (DWDM) applications. Calibration of instruments and systems for the measurement of optical properties is covered in detail, including optical power meters, wavemeters, optical spectrum analyzers and polarization controllers. Diploma Programs This course is a recommended elective for TTi’s Instrumentation Test Specialist (ITS) Diploma Program, and may be used as an elective for any of TTi’s specialist diploma programs. Related Courses Course 172, Fiber Optic Systems, covers related material but omits calibration and goes into greater depth on optical theory and fiber optic systems. Prerequisites There are no definite prerequisites for this course. However, this course is aimed toward individuals involved in a related technical field. Return Loss (RL) or "all loss"
Real Time Wavelength Meter, cont.